Every business uses electricity to run its computers, phone systems and lights at minimum. And generally, the bigger the equipment, the bigger the risk of electrical shock. Even working near power lines presents a risk to workers that requires consideration. Employers are required by OSHA to take prudent precautions to keep their workers safe. One of these precautions is the development of an Electrical Safety Policy. 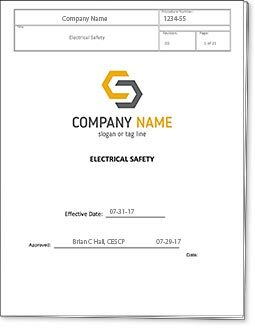 An ESP is intended to establish safety requirements for company administration, employees and even visitors who may utilize or be near electrically energized equipment during the course of normal activities. The ESP is a standardized document of approximately 18-25 pages and is based on principles and practices contained in the NFPA 70E 2015 edition. Ensure the safety of personnel who may work on or near electrical systems. Ensure that personnel understand and comply with standards related to electrical safety. Ensure that personnel follow uniform practices during the execution of electrical work. Reduce the risk of electrical hazards, equipment damage, and fire. Please explain any particular needs to be addressed. How long does it take to create an Electrical Safety Policy? Assessing your equipment, facilities and current procedures usually takes approximately 2 weeks. Upon presentation and review of our Safety Policy, there are typically one or two sets of revisions that take approximately two days each.. Complete and send this form and we’ll be in touch with you within 24 hours with your quote.